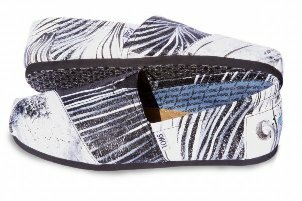 Singer Brandon Boyd of Incubus, along with artist Kristin Klosterman, have joined with TOMS Shoes to create the Collaborative Canvas Collection. Hand painted canvases, one by each artist and one collaboratively, will be used to create a run of limited edition TOMS. A total of 75 pairs of shoes will be produced, 25 from each canvas. TOMS shoes was created in 2006, by Blake Mycoskie. While traveling in Argentina, Mycoskie was moved by children he met that had no shoes. Wanting to help he created TOMS Shoes, a company that would match every pair of shoes purchased with a pair of new shoes given to a child in need. TOMS has given more than 140,000 pairs of shoes to children around the world. Brandon Boyd has exhibited his artwork at a number of galleries and shows. He has also published two books, which include his artwork as well as his writing: White Fluffy Clouds: Found Inspiration Moving Forward and From the Murks of the Sultry Abyss (Volume 2). The Collaborative Canvas Collection will debut at the Undefeated store in Silverlake, California on Saturday, September 26, 2009. The event will include a private reception from 6 - 7 PM, and will be open to the public from 7-10 PM. See the Pop Life Art celebrity artists list for links to the artwork of more than 100 musicians, singers, and actors.